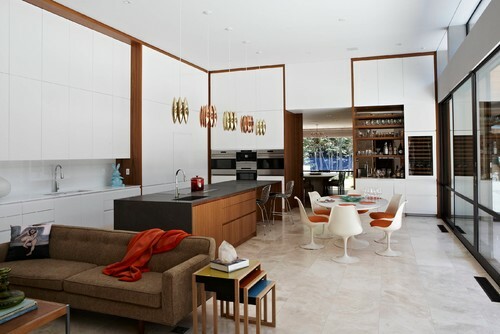 Photo by John Lum Architecture, Inc.
Another huge styling that is on the rise is Mid century modern design. It is sleek, clean lined, with a seamless flow. Current Mid century modern design uses contemporary patterns and unique organic forms on furniture and accessories for a chic and present-day styling that looks very hip. Mid century was really the first to create the bond between the outdoor and the indoor world by the use of large glass windows with little to no window treatments, glass doors and skylights which carries light into a room and allows the outdoor view to be a part of the home. Wood has an organic component which helps to bring the outdoor elements inside the home. Wood used for wall paneling, furniture, tables and doors were very stylish during this period. The mix of wood were inlayed with dark and light patterns which were popular in the 1920’s and carried on through midcentury decorating. Furniture was influenced by the industrial age so many pieces looked similar to buildings and other aerodynamic designs. We can’t forget the unique shapes and formations displayed in a space of mid century artwork, furnishings and architecture. There is no such thing as a straight edge when it comes to mid century room design. Curves, twists and bends on furniture, coffee tables and more are what keep these rooms interesting. Despite the minimalistic design approach, bright, bold and saturated colors and patterns in the way of fabrications, lighting, and artwork bring out the playfulness in midcentury. Colorful starburst and color blocking on fabrics, wallpaper and rugs give a hip and bodacious vibe to these spaces. Being comfortable in your surroundings is a must for any space. The one thing in which modern design is good at is creating a raw bones piece of furnishing and making it cozy and space saving. Eames chairs have been around over 70’s years yet they are the quintessential chair used in mid century rooms because of their light weight fiberglass build and cool contemporary look. Plus these are very comfortable with or without a cushion or pillow. Kitchens were designed to have everything at your finger tips by allowing a more popular floor plan called ,”the open floor plan”, where you can cook, entertain, watch TV and have conversation all in one space. Mid century architecture lay outs were allowing this open floor plan in homes and gave sitting areas comfort and functionality. Get Cottage Styling Now! Get Art Deco Styling Now!